Start your day with a delicious breakfast prepared for you by Suzanne. 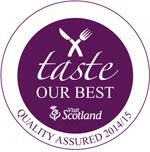 You’ll then understand why we’ve received a Taste Our Best award from VisitScotland. Relax at your own table in our elegant dining room. Enjoy the fine art, garden views, glimpses of the river and the aerial activity around our bird table. Fresh locally sourced ingredients are used wherever possible. Individually prepared fresh fruit cocktails burst with flavour and include Scottish strawberries and raspberries when in season. Traditional porridge made with oats from award winning Stoats of Edinburgh. Our full Scottish breakfast includes bacon and pork sausage from local butchers, famous Stornoway black pudding, Dingwall haggis, lovely free range eggs, vine tomatoes and chestnut mushrooms. Flakes of Speyside smoked salmon mixed with free range scrambled eggs served on toasted seeded or wholemeal bread. Succulent fresh oak smoked kippers or haddock from the Moray coast with poached or scrambled eggs. A buffet selection including Scottish cheeses and cold meats, oatcakes, croissants, morning rolls and a choice of very fruity preserves and marmalades. We have a range of quality teas and infusions and our fresh filter coffee and espresso beans are supplied by Caber of Aberdeen. Vegetarian, vegan, gluten or dairy free options. We are very happy to cater for any special dietary requests. Catching the 7.55 Glasgow train or planning a long day hill walking? Early breakfasts can be arranged or you can even take a tasty homemade packed lunch with you.